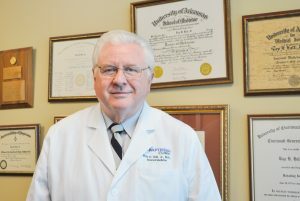 Jonesboro, Ark., November 2nd, 2018 – Dr. Ray H. Hall, Jr. MACP, at NEA Baptist has been awarded Mastership in the American College of Physicians (ACP), the national organization of internists. Election to Mastership recognizes outstanding and extraordinary career accomplishments. Masters must have made a notable contribution to medicine. This includes, but is not limited to teaching, outstanding work in clinical medicine (research or practice), contributions to preventive medicine, improvements in the delivery of health care, and / or contributions to the medical literature. “This recognition is the highlight of my career. It would not have been achievable without the support of my wife Barbara, my parents, my family, my professional colleagues, my teachers, my staff, my loyal patients, and my Lord and Savior, Jesus Christ”, says Dr. Hall. Dr. Hall is the Founder of the NEA Clinic in Jonesboro, Arkansas, which has evolved into the not-for-profit, progressive, multispecialty NEA Baptist Health System, through the culmination of Dr. Hall’s vision, commendable leadership, and persistent efforts. NEA Baptist Health System provides an entire spectrum of patient care services, from prevention to therapy both outpatient and inpatient, to survivorship, to a rural population in northeastern Arkansas. Dr. Hall has been the Chairman of the NEA Baptist Health System Board, and Co-Founder and President of the NEA Baptist Charitable Foundation Board, which was awarded the Edward R. Loveland Memorial Award in 2008. These boards are where he promotes the highest ideals of medicine, concern, compassion, and care for those in need. Dr. Hall has also served on the Arkansas State University Foundation Board and on the Chancellor’s Cabinet, as well as serving on the board of numerous civic organizations with distinction. He has been a member of the ACP Arkansas Chapter for decades, including a term as Governor from 2003 to 2007. Dr. Hall was instrumental in the creation of the internal medicine residency program at NEA Baptist and was integrally involved in the establishment of the NYIT College of Osteopathic Medicine at ASU. These efforts have embraced the teaching mission of our profession along with patient care and ensuring that adequate numbers of highly skilled, compassionate internists remain available for the local population. According to ACP bylaws, Master are elected “on account of personal character, positions of honor, contributions toward furthering the purposes of the ACP, eminence in practice or in medical research, or other attainments in science or in the art of medicine.” ACP activities are also taken into consideration for all candidates. This includes service to the ACP in an official capacity, participation in chapter activities, and involvement in the development of ACP products and educational programs. Volunteer and community service is also taken into consideration. ACP will honor new Masters at the annual Convention ceremony during the Internal Medicine Meeting in 2019, the ACP’s annual scientific conference will be held April 11-13 in Philadelphia, PA.